Just in case you haven’t noticed, Apple’s iPad is appearing everywhere. Classrooms, stores, and more importantly, in business offices. Now since the iPad has been around for the past several months, cases of every design are everywhere. 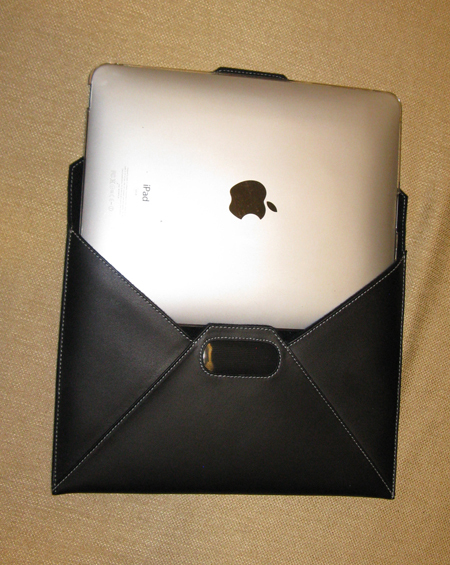 The question is what do you put your iPad in if you are going to be taking it to the office with you? Might I suggest that you consider Marware’s Eco-Envi + for the iPad. First, the Eco-Envi + consists of two items; a clear polycarbonate MicroShell that covers the back of your iPad and a high-grain eco-leather case with a fleece interior to baby your iPad when you place it inside. With or without the polycarbonate rear shell, your iPad slips into the case like a hand into a brand new glove. After several weeks of use, the iPad continues to go into the case with really no expansion of the leather so there is very little chance that your iPad would accidentally slip out if you turned the case upside down. I have turned my case upside down and the iPad has not moved at all. The flap on the case keeps the iPad inside and the dirt/dust outside. The design of the Eco-Envi + is simple yet extremely stylish and professional in appearance. As you can see by the photos, the case looks exactly like a portfolio previously used to carry paper and pen to a business meeting. However, the look on people’s faces when you open up the case and take out an iPad is interesting in that they weren’t expecting to see that happen. The case is done extremely well, including the stitching and interior. You would find that the case, with the soft interior, cushions the iPad and with the polycarbonate shell, this adds an additional layer that protects it from possible scratches, dings and whatever. The polycarbonate shell is a breeze to place on the iPad. Just place it down on a table, place the iPad into the shell and must gently push down. It holds firmly on to the iPad, no fear of it coming off unless you want to remove it yourself. I have been amazed at the amount of scratches I’ve seen on the polycarbonate sheet during normal usage. Imagine what the back of my iPad would look like without the shell. What a user does have to remember is that this is a case only; the Eco-Envi + does not convert into a typing platform for the iPad to sit on. However, what I did find is that if you need to angle your iPad to type, you just rest your iPad half on-half off the case and it suffices to permit you to type at a raised angle. Eco-leather, what’s that? I had the same question and found that Marware touts the leather as being more environmentally friendly than normal leather cases in that fewer toxins are used to produce the leather. This allows the case to comply with the Restriction of Hazardous Substances (RoHS) requirements and gives the user a more eco-friendly product. .8 x 8.5 x 11 inches ; 1 pound. Leather with fleece interior. All in all, I give the Marware EcoEnvi + for iPad a My Mac rating of 9 out of a possible 10.